Arsenal To Make Late Move For £9.5m Teenage Sensation? Despite Arsene Wenger’s protestations to the contrary, rumours are circling that Arsenal may make a late dip into the transfer market during January. 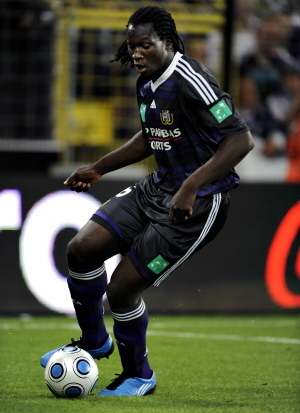 Reports from Belgium are suggesting that RSC Anderlecht’s teenage star Romelu Lukaku may be the subject of a last gasp £9.5 million bid from The Gunners. 16 year old Lukaku’s 12 goals in just 19 appearances this season have seen the Belgium U21 striker attracting interest from most of Europe’s elite – with Chelsea, Man Utd, Real Madrid and AC Milan all known to be courting the prolific teenager – but it seems like it will be Arsenal who are to make the first move, and a place under Wenger’s wing may prove too tempting for the young starlet to turn down. RSC Anderlecht is on fire at the moment, and they aren’t going to let Lukaku go. I also don’t see Lukaku wanting to leave yet. It’s actually his 1st season in the Jupiler League and he’s playing exquisitely, and he’s still too young and inexperienced to leave the league. I don’t see him leaving in the next season(s), but he probably will as all Belgian clubs are infected with money-horny asswhipes who won’t hesitate a second to let him leave for a decent amount of money. At least until the end of the season, he will stay, and I for one can keep enjoying his messing-around with retarded Belgian defenders. fabregas was only 16 when he first starred for arsenal so i cant see how Lukaku is too young. If he is good enough he is old enough! Yeah well, that was Fabregas, a starlet spanish centre mid, coming from Barcelona. We’re talking about a Belgian striker here, coming from a team whose individual guidance is significantly inferior to that of Barcelona :p (even if he’s been playing in the first team). Lukaku is a freaking animal on the pitch, but he lacks stamina, technique and tactical intelligence. You can’t compare Lukaku with Fabregas. Arsenal need to stop looking for youngsters and get what they really need which is an experienced striker since Robin Van puffsie is injured. FABREGAS IS GOING TO BARCELONA IN THE SUMMER! Every time you get a player with growing experience or skill you end out selling them Eg. Adebayor was just getting to his top level…SOLD!, HENRY was experienced and added mentality for the team…SOLD!, Flamini becoming a top player and …SOLD! Adebayor wanted to leave and was a disruptive force in the dressing room. Flamini chose not to renew his contract. Admittedly he was offered a deal quite late but it was his choice to leave on a bosman. Henry was having family problems and was looking for a new challenge.